This is a small sampling of articles related to media relations and publicity in the Connexions Online Library. 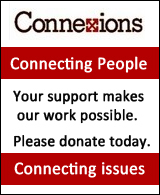 For more articles, books, films, and other resources, check the Connexions Library Subject Index, especially under topics such as media relations, publicity, public relations, fundraising, marketing, media coverage, media criticism, cause marketing, and propaganda. Media relations and publicity work are usually aspects of a broader organizing strategy. For many additional resources, tools, articles and books. 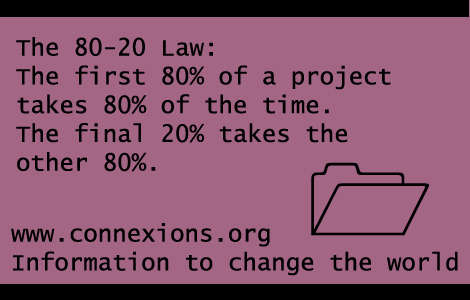 about organizing, see the Connexions Organizing Resources page. A guide for groups and organizations looking to get media coverage their cause. Mainstream media are good for getting exposure, but they are not necessarily the best avenue for reaching the public about a particular issue. Before setting out to get media attention, you should ask whether, in your particular circumstances, the potential benefits of media coverage outweigh the possible drawbacks. George Lakoff explains how conservatives use language to dominate politics, and how the left can fight back. How to get coverage for your cause in community newspapers. Demonstrating that they have sound expertise is an increasingly important part of the marketing mix for many organizations. The right’s enormous success in framing public debate is based not just on isolated issues, but on an overall definition of what the debate is about. This guide suggests ways that progressive community-based advocacy groups can reframe the right’s definition of the debate – ways that can connect with deeply-held values and understandings. It is designed to help advocates frame their views for the media, develop educational programs and materials for their constituents, and talk to their fellow citizens in meetings and informal discussions. Public relations practitioner Michael Levine offers some advice on dealing with the media. Ask these questions before answering their questions. Understanding what reporters want from media spokespersons when they are covering an issue in the news. Reporters – and readers – want a good story. The story should be interesting and relevant to the audience, and it must be written clearly enough that it can be quickly and easily understood. Writing letters to the editor is an effective and inexpensive way of getting publicity for your point of view, your cause, and your organization. The Letters page is one of the most popular sections of any newspaper, and is therefore a good way to keep your name and your core message in front of the public. A guide to writing letters to politicians, something you may do in parallel with a campaign directed at the media. An online directory which lists all Canadian media: newspapers, magazines, TV, radio, online media. Available online, and as a database, with single- and multi-user subscriptions. Annual subscriptions cost $109.95: available here. Keep these points in mind when planning a news release.. Tips for producing effective, high quality newsletters. The best brochures combine elements of marketing (they sell your organization) and public relations (they educate the reader). Lessons for non-profits form the for-profit sector. A case study of using public relations to enhance a charity’s fundraising activities. Organizations can sometimes increase their TV impact by producing their own video of events. How to make your Web site media-friendly. A tool that helps lead the media to you when they are doing a story on the issues you are concerned about. Used by hundreds of associations to help get their message out. Articles and resources about media relations, publicity, public relations, fundraising, and related topics from experts in the field. By Aidan Ricketts. A guide to grassroots activism. Practical tools, methods and strategies needed for a successful campaign. Richard Earl explains how to craft a public service campaign. By Andrea Langlois & Frederic Dubois. Autonomous media are vehicles of social movements that attempts to subvert the social order by reclaiming the means of communication. How media can be used to raise an organization’s public profile and improve its connection with the target market. Every aspect of media relations is covered including crisis management, handling an interview, planting a story and mastering the tools of the trade (media kits, releases, videos, conferences).. Author George Lakoff explains how conservatives think, and how to counter their arguments. He breaks down the ways in which conservatives have framed the issues, and provides examples of how progressives can reframe the debate. Guerilla P.R. Wired: Waging a Successful Publicity Campaign Online, Offline, and Everywhere In Between. A guide for small companies who cannot afford a PR firm and do all their own marketing. A quick, concise reference book, a practical, reader-friendly guide to media relations. A guide to good interviewing with experiences of professionals as examples of how to go about it. The tone is very showbiz and very Hollywood, with lots of celebrity references, but the advice for handling interviews is first-rate. William Wray Carney provides thorough explanations of who the media are, how they work and how to approach them with stories..
Jason Salzman explores ways in which organizers can be creative and innovative in using the media to publicize their cause.. Focuses on how to effectively use words to generate publicity. A review of eight good resources for people working on getting publicity for their cause. The Connexions Calendar is a national calendar listing events related to social justice, human rights, democratization, and grassroots groups and movements generally. Listing your events in the Connexions Calendar is free, and is a good way to publicize your activities. The submission form is here. You need a username and password, which you can get for free by contacting Connexions here. Other calendars you can use to publicize your events include rabble, PlanetFriendly (environment-related only), and Sources (designed to inform editors and reporters about events for which media coverage is desired; ability to post events is included in Sources membership). Local newspapers and their websites also often have calendars lists events in their community. While the mainstream media are important because they reach so many people, alternative and non-mainstream media are also be important because they are more likely to actually report on your issues – and their reports are more likely to be accurate and sympathetic. This is a selected list of alternative media compiled for Connexions. Media training can help you prepare for the challenge of meeting the media.